You decided to create a Facebook page for your company? But are you wondering how best to tackle this? Facebook currently has around 1.8 billion active users worldwide. Therefore, a Facebook page for large but also small and medium-sized businesses today is absolutely necessary. The world’s largest social media platform offers entrepreneurs many opportunities and is constantly evolving. We’ve put together a detailed guide for you so you can get started with your social media marketing today. If you do not have an account on Facebook, you can register for free at www.facebook.com . All you have to do is enter your name, an e-mail address, a password, your date of birth and your gender. 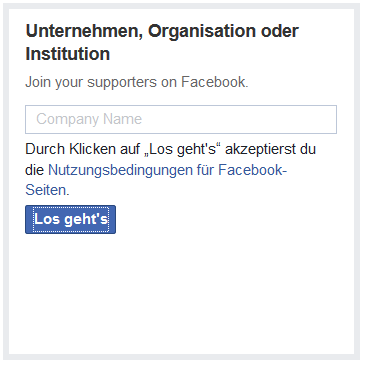 Note: As you can see, you can also create a Facebook page for a company without a private Facebook account. We do not recommend this. The functions of your Facebook page will be limited to a lot later. Click on „Create page“ in the top right menu. Now choose the appropriate category for your company. Note: To prevent people from checking you in at home, you should only choose Local Business or Place if you have a shop or an official office. That’s because Facebook automatically turns the page into a location. You can also change the section later. We select the company here. Now you have to think of a name for your site. Choose a name that suits your company, brand or page. 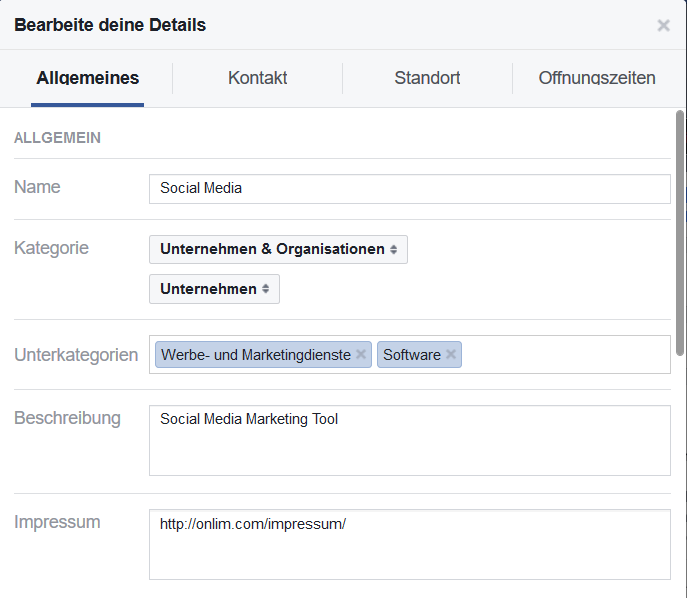 These hints can help – Which page names are allowed on Facebook? You can also change your page name later. If you have only a few Likes on the side that is not a problem. However, if you have a few hundred likes, a change to the page name should be well thought out. The first step is to add a description of your business that will be on your page. Try to give a concise but precise description of what your Facebook page is about. You should also remember that you are inserting relevant keywords. This will help you to find your site later. 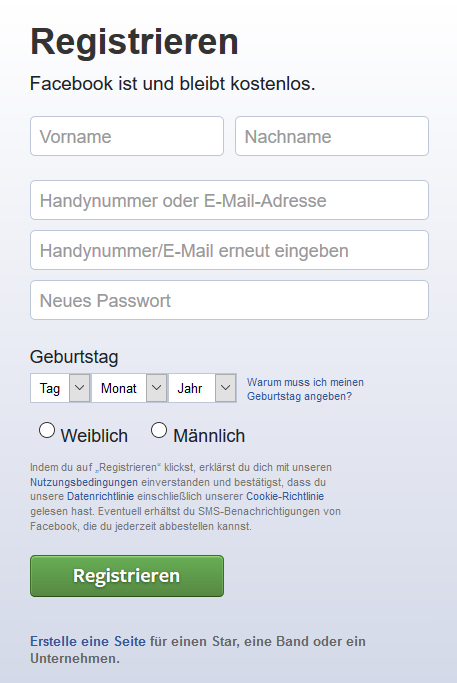 Add your website and choose a username for your page. Attention, username is not the same as pagename. The username will appear later on your page with a preceding „@“ just below your page name. It allows other people to find your page easier in the search. With the personalized URL people can visit your page eg via fb.me/onlim.io. Or send a message via m.me/onlim.io to your site. We therefore strongly recommend that you choose a username. There are clear guidelines from Facebook. See Which policies apply to creating a custom username for my page or profile? You can also change your username later. In the second step you select a profile picture. Facebook recommends a square image with at least 180×180 pixels. At the same time, Facebook adjusts it and displays it with 160 x 160 pixels. Choose if you want to add your page to the favorites of your private profile. This is up to you personally. I always add my pages to favorites. So I can access it much easier and faster. The fourth step is to set your preferred page target group. Your page will remain visible to all persons. However, this option allows you to limit your audience. Facebook takes into account your selection when people search for similar companies or services. Du kannst deine Eingaben später natürlich auch noch anpassen. Wenn du alle Angaben eingegeben hast, klicke auf speichern. Damit das alles nicht ganz so leer aussieht, füge nun auch gleich noch ein Titelbild hinzu. Desktops stellen das Titelbild mit 820 x 312 Pixel und Smartphones mit 640 x 360 Pixel dar. Es muss jedoch mindestens 399 x 150 Pixel groß sein. Daher empfehlen wir eine Größe von mindestens 828 x 315 Pixel. Achte dabei darauf, dass links und rechts außen jeweils kein Text steht. Dieser würde, wenn du die Seite am Handy anschaust, abgeschnitten werden. Um ein tolles Titelbilds zu erstellen auch ohne viel Erfahrung mit Design empfehlen wir Canva. Gleich unter dem Titelbild siehst du einen blauen Button. Damit können Besucher mit dir Kontakt aufnehmen, zu deiner Webseite gelangen, dein Produkt kaufen etc. Klicke einfach auf „Button hinzufügen“ und du siehst alle möglichen Optionen. Nutze den Button so gut wie möglich! Klicke im Menü unter deinem Titelbild auf „Mehr“ und gehe auf „Seiteninfo bearbeiten“. Damit kannst du weitere Details zu deinem Unternehmen eingeben. Es ist immer gut wenn du Informationen zu deinem Unternehmen möglichst vollständig angibst. Damit hilfst du Besuchern alle nötigen Details schneller zu finden. Außerdem erweckst du damit mehr Vertrauen in dein Unternehmen. In der Kategorie „Allgemeines“ kannst du den Namen oder die Kategorie deiner Seite ändern. Damit man deine Seite leichter findet, kannst du hier bis zu drei relevante Unterkategorien hinzufügen. Zudem kannst du hier auch die Beschreibung deines Unternehmens eingeben sowie den Link zum Impressum auf deiner Webseite. 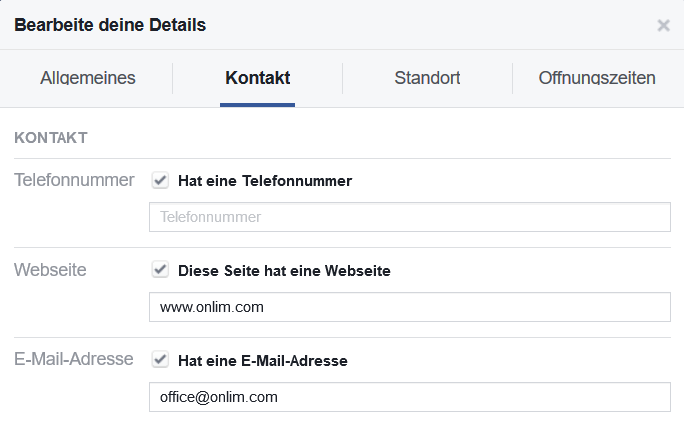 Füge in der Kategorie „Kontakt“ die Telefonnummer deines Unternehmens, die Webseite sowie eine E-Mail-Adresse hinzu. Gib im nächsten Schritt die Anschrift deines Unternehmens an. 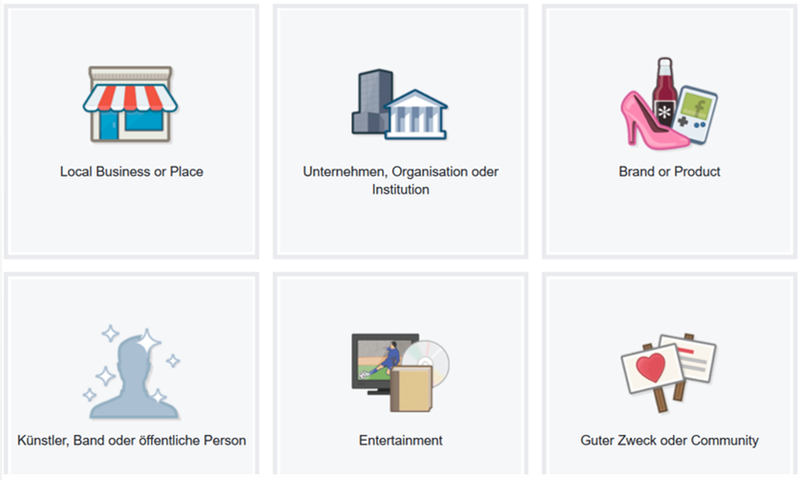 Soll deine Seite die Karte und eventuelle Check-ins von Nutzern einzeigen, setze einen Hacken bei „Show map und check-ins on the page“. Zum Schluss, kannst du hier zusätzliche Informationen angeben. Zum Beispiel öffentliche Verkehrsmittel, mit dem dein Standort erreichbar ist, Parkinformationen sowie die Öffnungszeiten deines Unternehmens. Vergiss nicht alle Änderungen zu speichern. Hiermit hast du vorerst die wichtigsten Informationen angegeben. Bevor du nun mit den zwei letzten Schritten loslegst, kontrolliere auch noch die bereits voreingestellten Einstellungen. 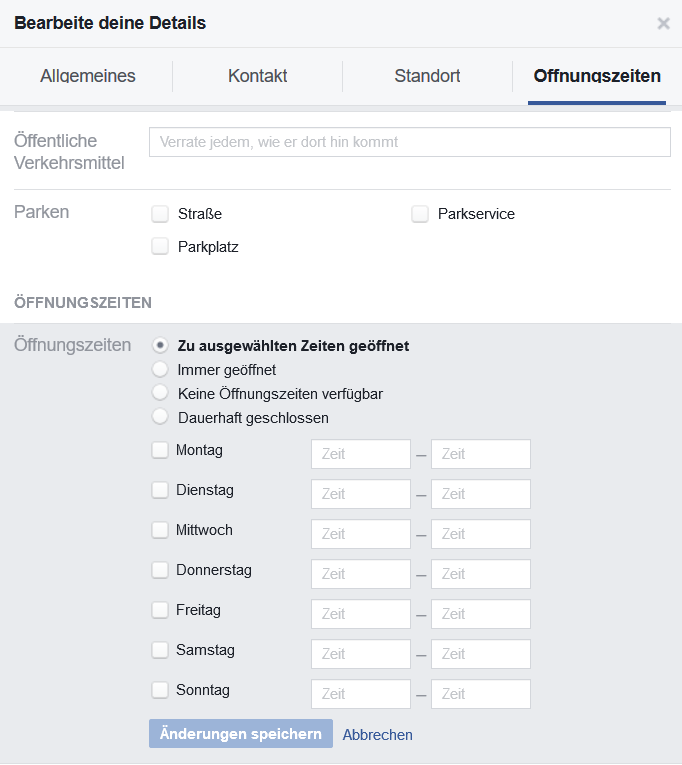 Dabei hilft dir dieser Artikel – Facebook Einstellungen die jeder kennen sollte! 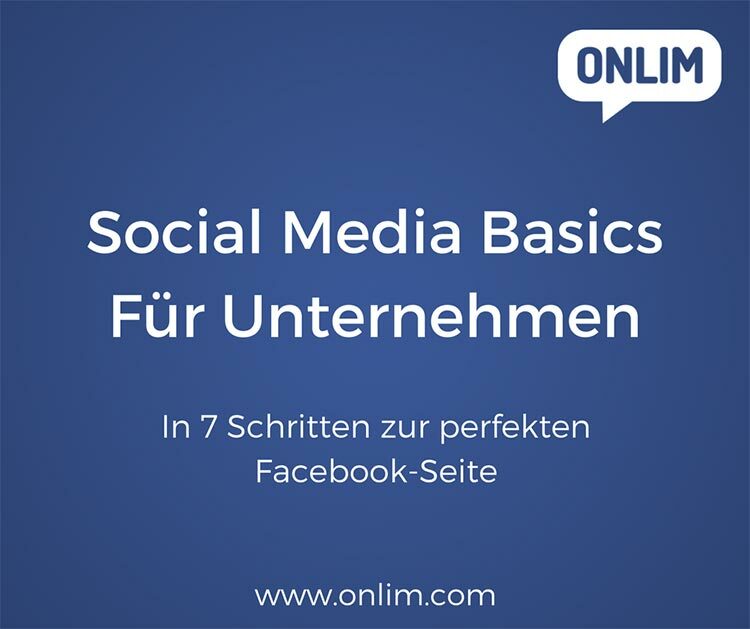 Bevor du im letzten Schritt deine Freunde einladest die Seite zu liken, erstelle deinen ersten Social Media Beitrag auf Facebook. Damit sieht die Seite nicht ganz so leer aus. Sei kreativ und überlege dir, was für die Besucher deiner Seite relevant sein könnte. Dabei kann dir Punkt 5 in diesem Artikel helfen. Nun steht dem Erfolg deiner Seite nichts mehr im Wege! Like die Seite, abonniere sie und lade deine Freunde dazu ein. Damit hast du einen guten Grundstein für dein Social Media Marketing gelegt. Note: Click the arrow next to „Subscribed“. Select „Show first“. Thus, new posts and updates of your page in your news feed are always displayed first. You should also point out this attitude to your fans. Otherwise, your posts in the filled news feeds can easily go down. You can also share your page right now with your private profile. Now I wish you a lot of fun and success with your Facebook page and your Social Media Marketing!